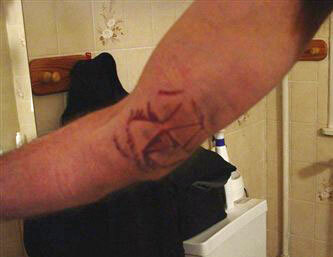 Tachyonized Elbow Treatments are very successful! Using Tachyonized tools provides nearly 100% success. Please keep in mind, the treatments depend on covering the entire area with Tachyon energy and keeping it on until the swelling or pain is gone. The biggest issue with elbow problems is that healing with Tachyon is so fast-acting that there is a tendency to stress the elbow before it has fully returned to balance. Give it plenty of time to recover and go easy on it! The photo shows how directional and effective the Tachyon tools were. Bruising occurred only outside the areas covered.